Our host for this year’s conference is Park City Resort. Choose from 3 newly renovated properties that are conveniently located in the popular Canyons Village area of Park City. Discounted room rates start at $192 per night and are available to NABS attendees and their families until December 6, 2018. Each property offers a variety of options from standard hotel room up to a 3-bedroom suite. Be sure to click on the blue-underlined links (or hotel photo) to learn more about each property and what it has to offer. The main meeting area for this year’s NABS Conference will be the newly renovated Grand Summit Hotel. No stone was left unturned in the rebirth of this iconic ski-in/ski-out property that’s nestled in the heart of Park City Resort’s Canyons Village) directly across from the Orange Bubble Chair lift and the Red Pine Gondola.) The Grand Summit also features the new Rock Resorts Spa as well as a new eating venue: First Tracks Café. *Suites, at the above-referenced pricing levels, are not being held at present, other than specific suite types that might appear under “Guest Accommodations.” The suite pricing referenced above is for attendees that might be interested in more spacious and luxurious accommodations. Requests will be accommodated based on availability. Just next door to the Grand Summit and steps away from the slopes, sits the newly renovated Sundial Lodge. With its intimate lobby, rooftop hot tub, new outdoor heated pool, and ruggedly elegant atmosphere, the Sundial Lodge is in the heart of Canyons Village and is the center of all the action. Just across the street from the Grand Summit Hotel, lies Silverado Lodge. Masterfully designed with cozy fireplaces, vaulted ceilings and oversized decks that grace many of the suites, Silverado Lodge also gives you quick access to world-class skiing. This property offers guest room accommodations consisting of individual hotel rooms, studios and 1-3 bedroom suites. Reservations need to be telephoned directly to the Resort Reservations Department by calling toll free at (888) 416-6195. In order to receive the Group rate, callers must identify their affiliation with North American Burn Society Annual Conference. Rates cannot be changed at check-in or check-out for guests who fail to identify their affiliation at the time the reservation is made. Make your reservations by December 6, 2018 to receive your discount! A Deposit equal to two (2) night’s stay is required to hold each individual’s reservation, with final payment due thirty (30) days prior to arrival. Reservations made within thirty (30) days of arrival will be required to be paid in full at time of booking. Such deposit shall serve to confirm the reservation for the date(s) indicated. This deposit is refundable if notice of cancellation is received at least thirty (30) days prior to arrival and a cancellation number is obtained. All deposits shall be charged at the time the reservation is made. No refunds for late arrivals, early departures or down grades. The Resort Fee includes: Unlimited Valet Parking, Convenient Ski Valet and Ski Storage, Bell Service and Luggage Storage, Bike Storage, Pool, Hot Tubs and State of the Art Fitness Center, In-Resort On-Demand Transportation, in-Town Scheduled Transportation, Resort Wi-Fi Internet, Daily Newspapers, in-Room Coffee/Tea. 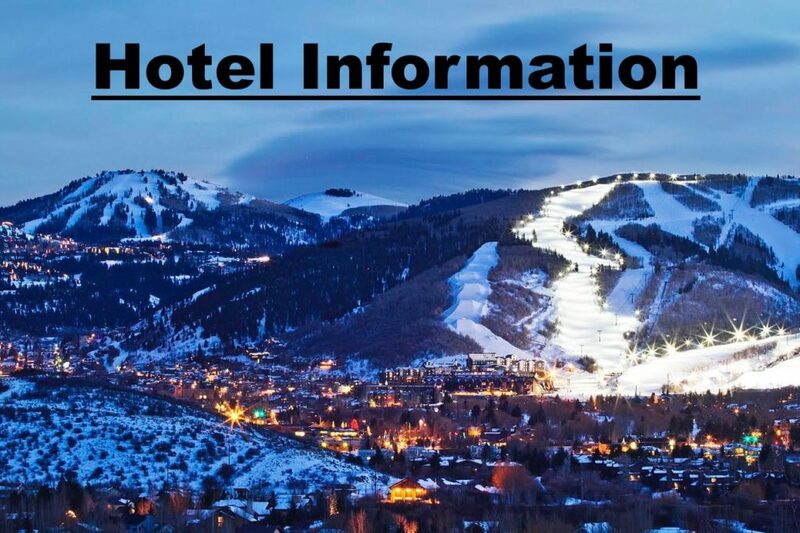 The Resort Fee includes: Convenient Ski Valet and Ski Storage, Bike Storage, Luggage Storage, In-Resort On-Demand Transportation, in-Town Scheduled Transportation, Resort Wi-Fi Internet, Daily Newspapers, and In-Room Coffee/Tea. Midweek housekeeping is included with (5) five nights or more. Daily housekeeping available on request at an additional fee. The Resort Fee includes: Unlimited Parking, Convenient Ski Valet and Ski Storage, Bell Service and Luggage Storage, Bike Storage, Pool, Hot Tubs and State of the Art Fitness Center, In-Resort On-Demand Transportation, in-Town Scheduled Transportation, Resort Wi-Fi Internet, Daily Newspapers, in-Room Coffee/Tea. Midweek housekeeping is included with (5) five nights or more. Daily housekeeping available on request at an additional fee. Valet / Underground parking at the Grand Summit Hotel is included in the Resort Fee for overnight guests and $8.00 per car for meeting attendees not lodging with us. This is good for up to an eight (8) hour period. Underground parking for Sundial Lodge and Silverado Lodge guests is complimentary. Parking fees in all three Park City managed Lodges are subject to change.